For 15 years, Dr. Sean McCance has directed Spine Associates, one of the leading spine surgery practices in New York City. He has been recognized by his peers as one of the most accomplished surgeons in the field. 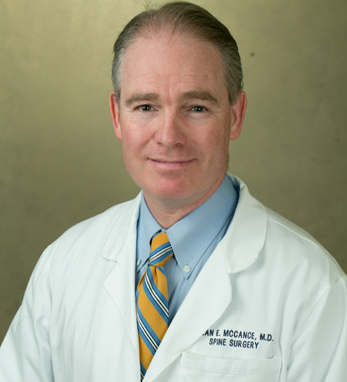 Dr. McCance also serves as Co-Director of Spine Surgery at Mount Sinai Hospital in New York City, and is an attending spine surgeon at Lenox Hill Hospital. He has performed more than 4,000 spine surgeries on patients from all over the world and from all walks of life. He has particular expertise in complex reconstructive spine surgery including revision cervical and lumbar surgery, scoliosis, and spondylolisthesis. Dr. McCance has been featured in New York magazine’s “Best Doctors” from 2012-2015. He was recognized in a national physician survey as one of the “Best Doctors for Spine Surgery” in 2003, and has since been selected by numerous peer-reviewed organizations including Castle Connolly’s Top Doctors, New York Super Doctors, and America’s Top Physicians. He has also received the Patients’ Choice Award. He has authored numerous articles on spine surgery, on topics including cervical and lumbar surgery, scoliosis, and sports-related spine injuries. He has presented his research at national and international meetings and is a member of the North American Spine Society and the Scoliosis Research Society. Dr. McCance’s Irish heritage is from Galway, which is his mother’s hometown, and Cork, where his father was born. Dr. McCance has visited Ireland many times, and has continued to share that heritage with his family and children.